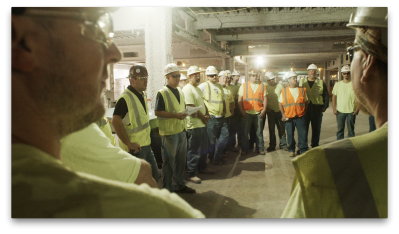 Safety is integral to our unique company culture and core values: We care about our people and their families, and we hold each other accountable for working safely. Hiring the right people and collectively and individually sharing our core values. Knowing the details - through planning and executing the work safely. Engaging at all levels - setting a great example of completing all tasks safely, at work and at home, by everyone from company leadership to craft professional. Mentoring & coaching - acting as a mentor and coach to show team members how to practice good safety behavior. Hearts, Minds and Safety Program - focuses on site conditions. Hearts & Minds Commitment Program - focuses on changing worker behaviors and promotes safe actions through training, observation and feedback. Safety Accountability Program - outlines our safety accountability process. Our traditional site conditions-oriented program is rooted in our Hearts, Minds and Safety Manual. Our safety manual is a living document that addresses required OSHA regulations while empowering project teams to create detailed project and task-specific safety plans. The Hearts, Minds, and Safety Manual helps jobsite leaders communicate safety responsibilities to site personnel, identify and provide appropriate Personal Protection Equipment (PPE), develop emergency action plans, understand and fulfill education and training requirements and keep proper records. Our Hearts & Minds Commitment Program enhances the site-conditions program, which is employee-driven and observation-oriented and provides positive feedback and constructive recommendations on targeted safe practices. The Safety Accountability Program is our way of engaging our people and those employees from our subcontractors and suppliers to hold each other accountable for safety behavior. For those whose behavior falls below our accountability expectations, we provide hands-on coaching & mentoring as well as additional measures for serious infractions. As a result of Limbach’s rigorous safety programs and commitment to the well-being of all workers at work and home, we have maintained a long history of exceptional safety results. The following table represents Limbach's Experience Modifier Rate (EMR) when compared to the national benchmark of 1.0 since 2009. We are proud of our safety performance and strive to achieve the lowest possible rating with a goal of achieving and sustaining 0.0.